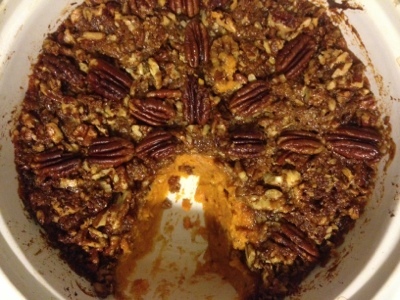 One fan, Callie, asked for a sweet potato casserole. This is a dish that is near and dear to my heart because I am Southern and when sweet potato casserole is on the table down South, you know it's a special occasion. On the other hand, I really don't love sweet potato casserole. And for a lot of reasons, mainly because there's rarely any sweet potatoes in it. 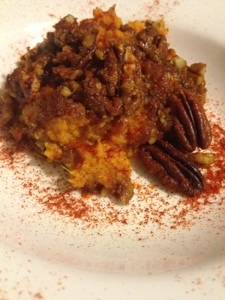 We call it sweet potato casserole but really it's a yam casserole. Also, what's up with the marshmallows? Yams are sweet enough on their own do we really need all that? The dessert like flavoring of this dish has always turned me off when we've been gathered at past Thanksgiving, but I can honestly say, this dish was amazing. I am even thinking about making it again next week for the big day! I'm a fan of the sweet and spicy combo so I gave a thick sprinklin' of cayenne to my portion. Boil your sweet potatoes until tender and then mash them with the 2 tbsp of vegan butter until smooth. Add the vanilla, maple syrup, sea salt, nutmeg and cinnamon. Pour into a lightly oiled 2 qt casserole dish. 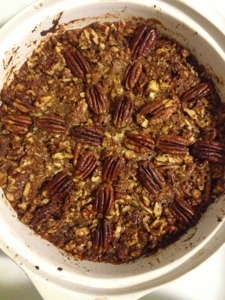 In a food processor, pulse the vegan butter, sucanat, and pecan halves until they form a crumbly mixture. Sprinkle topping mixture over the casserole and bake for about 50-60 minutes.